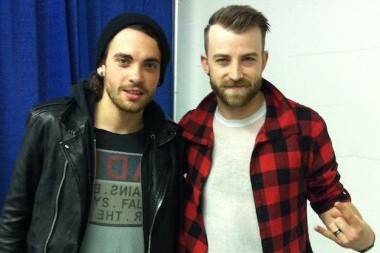 Paramore’s Jeremy Davis and Taylor York. Ria Nevada photo. Over 50 bright-eyed teens in punk gear were hanging around the entrance of the PNE forum late Wednesday afternoon just hoping to catch a glimpse of Tennessee’s Paramore. The alternative rock group has been a dominant force in the pop-punk scene since their multi-platinum release Riot. Infectious tracks like “That’s What You Get” and “Crushcrushcrush” made them a household name – with a little help from placement in the Rock Band and Guitar Hero video games. 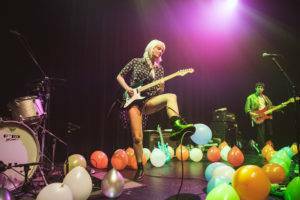 Paramore is currently on tour in support of their fourth studio album, a self-titled assortment of catchy tracks that stray a bit off their alternative rock path. Lead singer Hayley Williams was nursing a cold and was forced to conserve her voice for the show, but bassist Jeremy Davis and guitarist Taylor York were happy to chat about some of their more anxious moments when writing and recording their latest record. They opened up about the recent changes in the band’s line-up, the coming-of-age themes they grappled with, and how they’re doing their part to support music education in high school systems. Then we wandered off into other usual topics like high school funk bands, childhood dreams of being a baseball field (you heard me), and potential WWE stage names. It’s easy to see why tweens throughout the world have fallen head-over-heels for these charismatic and kind-hearted rockers. Ria Nevada: You guys are just about to hit the 10-year mark as a band – do you plan on doing anything special for this occasion? Taylor York: Yeah, we will do something. We don’t have anything quite worked out yet. But even if we did, we couldn’t spoil it right? Jeremy Davis: We want a teaser too. TY: Yeah! It’s so surreal that it’s already been almost 10 years. It is unbelievable. We’re so thankful to still be together and so close. RN: The latest self-titled album really goes into strong “coming-of-age” themes, and you guys have had the unique experience of “maturing” in the public eye. Have there been times where you’ve wanted to just take a retreat from it all and wrestle with growing up without people expecting a record out of it? JD: I think we have that feeling like four or five times a year. JD: No, it’s really tough being on the road and constantly being gone and having the pressure of fans and labels for new records and everything. There’s a lot of stuff that makes you want to like, go home and just be normal and wish nobody knew who you were dating or everything about your life. But you know, we love it so much. RN: There’s always just that awkward period between like 15-19 – I’m glad, and it was for the betterment of the world that I was holed up in my room for those years. TY: There are definitely times when you see like videos on Youtube of yourself in your late teens or whatever just doing something so stupid. I don’t know, it’s so embarrassing – like that’s out there for everyone to see. RN: They say that when you’re ever feeling a little lost in your life path, you should look back to what you wanted to be as a 5-year old, and that puts you back in touch with your real passions. Is what you’re doing far off from what you dreamed to be? JD: I told my parents I either wanted to be a fire truck or a baseball field! TY: (laughs) I wanted to be a veterinarian so I think I’m pretty off too! TY: xYou can be a fire truck still. RN: There was more of a time gap between recording this album and Brand New Eyes – was there a shift in your songwriting process? TY: Yeah, I mean we were a five-piece and two were gone, and then were three. I think we were ready for a change and we had grown a lot. I think that we needed a change and had something else to say but logistically alone we had to change everything. It just didn’t work the same way. RN: The dynamic was completely different. TY: Pre-production for Brand New Eyes, we all got in a room and just like hashed things out with the full band. We couldn’t do that this time. So every song is different, you know, every song was written different and came about differently. It was all very organic but it was just very new for us which was cool! I think a lot of times we had that same feeling when we started the band, you know? There’s just those nerves, but also that genuine passion – it was almost like an old friend that we hadn’t see for a while. RN: That’s what I found listening to the album, it’s just so diverse. It really is uplifting – from the images of daydreams to the fun instrumentation and arrangements. What influenced you to bring in the ukulele on “Moving On”? TY: It’s funny because we’re on tour with HelloGoodbye right now and when we met them, the first show we played with them was in Hawaii and they had a lot of ukulele on their last album. So Forrest the singer asked me to play on a song in Hawaii, so like I’d never played one before so I was like, “Woah, cool!” So when we were in the studio writing, we kind of hit a huge writer’s block and we just saw a really crappy ukulele in the corner of the room and just picked it up. I think there were some things that we had to say to move on and to kind of really give to the record writing process. We wanted to ignore and move past a lot of things we were dealing with and I think those ukulele songs, especially using that instrument, we were able to say what we needed to say in more of a light, fun manner, you know? Not make something too serious and angsty about it, but still be able to kind of put it out. RN: xThen there’s the gospel choir coming in on “Ain’t it Fun”! All that soul! Was this a throwback to your funk days with The Factory? JD: Haha – it was! Yeah, it was really exciting to be able to do that. I was actually really nervous about recording it, because I was like, I’ve never had to slap bass on a recording, just for fun like you know in an old band playing on stage. So it was really different – but yeah, it was a lot of fun! It’s exciting to me that just the general public are accepting funk again and loving it. I think it’s the right time as well. But like Taylor said, we took all these songs one at a time and whatever that song needed we tried to add and a lot of times it took us down different routes that we’d never been down, like the choir and having more funk songs. But I think that’s what this record was all about really. RN: Is the choir gonna show up tonight? TY: It’s really exciting – we’ve been able to work with the Grammy Foundation for schools. So in some cities we’re working with high schools, and a high school choir will come out and join us. We’re trying to get choirs for everywhere, like tonight we have the Sir Charles Tupper Secondary choir. It’s super fun and really special for us! JD: It’s cool, it’s a local thing. TY: Jeremy and Haley were involved in music programs in school and I don’t think we’d be here without those programs. RN: That’s so important, because a lot of schools are cutting out their music programs and I think that’s just insane! JD: It just makes more kids think that it couldn’t be a profession or that it’s not a dream to follow, you know? RN: Exactly. When now more than ever there are so many avenues to pursue music. TY: And those are such impressionable years that if there’s not a way to kind of learn about that or just try it, or to be taught… We all grew up with music classes and I can’t imagine not having that. RN: Yeah. Well speaking of influences, you guys have done a cover of Loretta Lynn’s “You Ain’t Woman Enough” live a few times – did you know that she’s playing a show up here in a few days? JD and TY: Oh Really?! JD: That’s so cool. She’s so rad – I didn’t know she was still touring, especially out over here? That’s crazy. TY: That’s so cool. I can’t imagine playing when we’re 81. (to Jeremy) Can you imagine playing “Ain’t it Fun” when we’re in our 80s? JD: I know! That would be ridiculous. That’s awesome. TY: I think she was gonna try and come to that show that we did that cover. But something about it being difficult, it might have had to do with her age and getting around. But she’s gonna be here in two days so probably not! RN: Her nickname is pretty awesome too – “The Coal Miner’s Daughter”. Kind of reminds me of a wrestling stage name. So with that in mind, you guys are playing in an arena, what wrestling name would you give each other? And a theme song! RN: The pressure’s on now. JD: This is difficult – and especially I think the hardest part I would say is choosing the song that he (Taylor) would come out to. Because he listens to different music – like every time he’s playing something I’m like, “That’s cool, who’s that?” and it’s always a band I’ve never heard of. I don’t think anybody’s heard of. RN: Just from the depths of SoundCloud. JD: Somehow he’s getting all that good music. His would probably be different music walking out every night! TY: Oh my gosh. That’s a tough one man! JD: (to Taylor) What’s my wrestling name? RN: Oh you guys could be a team! Just pick one theme song. Do you remember the Bushwackers way back in the day? JD: We should do Double Vision. TY: We could be the Barracuda Brothers. JD: Barracuda Brothers – that’s it. Our song would be “Double Vision” by uh, who’s that by? (sings) I’ll figure it out. TY: “Double Vision”. By someone. This entry was posted in Homepage Features, interviews and tagged bands, concerts, Hayley Williams, Music, Paramore, Vancouver. Bookmark the permalink. Pingback: Paramore Brasil» Blog Archive » The Snipe em entrevista descontraída com Jeremy Davis e Taylor York.